So, Whatever Became of Mosul’s Christian Institutions and Buildings Marked by the Arabic ‘N’? A few weeks ago, you likely saw pictures of Christian owned buildings in Mosul marked with the symbolic “Arabic nun” (the first letter representing Nazrani or Nazarene), for evacuation or destruction. Some on social media took on the Arabic letter as an icon or profile picture to show solidarity. So, what happened to those buildings? Since taking over Mosul on June 10, ISIS has destroyed, occupied, converted to mosques, converted to ISIS headquarters or shuttered all 45 Christian institutions in Mosul. Following the jump is the complete list of the Christian institutions formerly in Mosul, grouped by denomination. Since radical Islam knows no doctrinal distinctions among Christians, the list includes places of worship, residence or office formerly used by Evangelical Presbyterians, the Syriac Catholic and Orthodox Churches, Chaldeans and Armenians, and others. 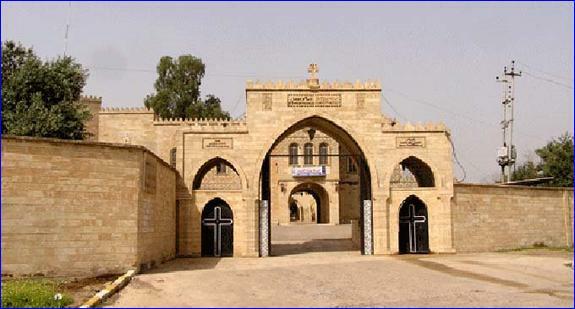 Mar Behnam (St. Behnam) Syriac Catholic monastery in the Ancient Assyrian town of Nimrod is now occupied by ISIS. Christian Cemetery in the Ekab Valley which contains a small chapel. This information first appeared in AINA, the Assyrian International News Agency. View the original article here. K.A. Ellis holds a Master of Fine Art from the Yale University School of Drama and a Master of Art in Religion from Westminster Theological Seminary. She is both performing artist and educator, happily married to Carl Ellis, Jr. Follow Karen on Twitter @K_A_Ellis, where she tweets about the places where theology, religious freedom, and human rights intersect. Want to follow this blog and receive notifications of new posts by email? Enter your email address here.